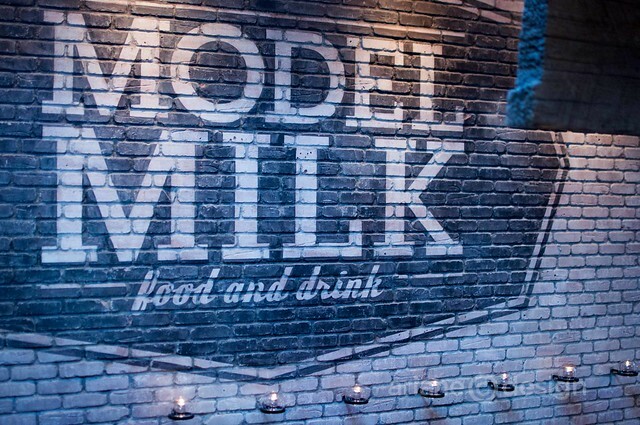 Model Milk Bistro is one of the latest gourmet restaurant destinations to hit Calgary’s already busy dining scene. I was lucky to have had a reservation to enjoy Vancouver transplant executive chef/co-owner Justin Leboe’s creations in a converted 1930’s dairy. Model Milk was the first dairy to use delivery trucks to bring fresh milk to most of Alberta. 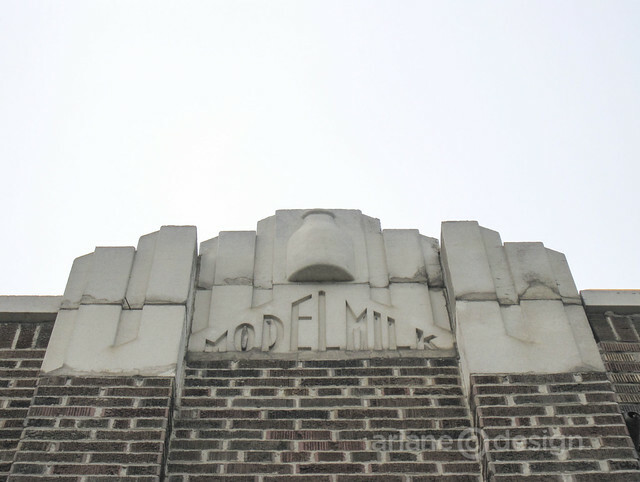 The milk was pasteurized in this very building; Model Milk was later sold to Prairie Dairy in the 60’s. The building eventually hosted a series of bars until September 26, 2011, when it returned back to its original name. Model Milk interiors peel back layers of history as part of a mindful restoration that includes reclaimed brick and warm woods leading to an open kitchen at the back. 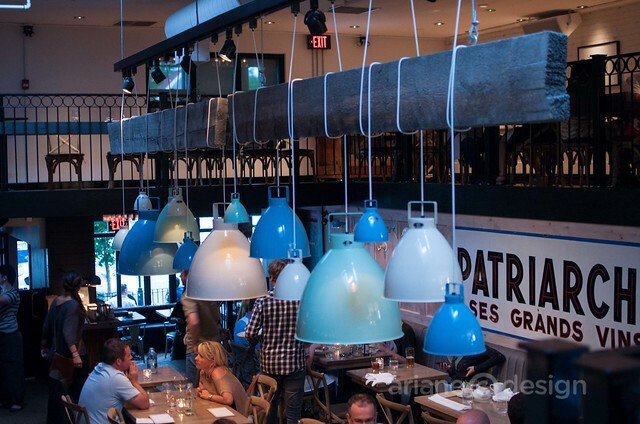 The atmosphere is casual, with wooden tables fed on a long steel beam that can be joined or separated as needed. The music played was a combination of 60’s through present rock and lounge styles. Located at the start of Calgary’s popular Red Mile District, this restaurant was filled to capacity by the time I left. The lounge at the entrance was originally used by Model Milk in the 1930’s as a milkshake and ice cream bar for the dairy’s family members to enjoy on the weekend. 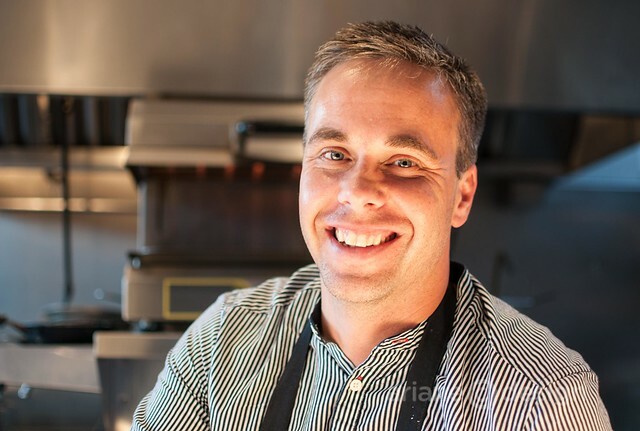 Chef Leboe previously worked at Calgary’s Rush, and spent time staging at French Laundry as well as in various restaurants in Bermuda before opening Model Milk. 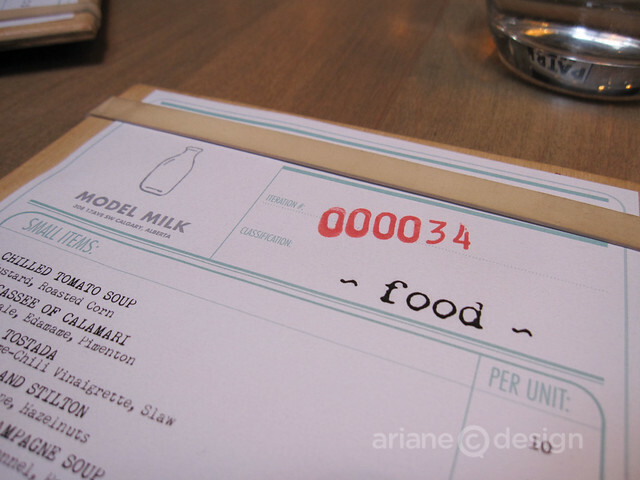 The menu changes every three weeks or so, and menus are custom-stamped per issue. 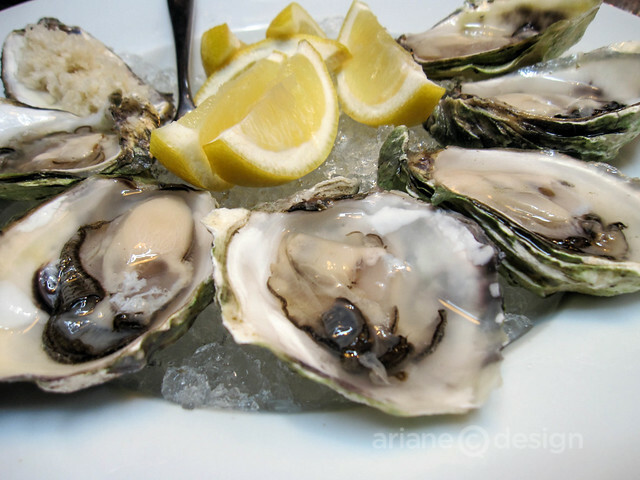 I began the evening with a half dozen West coast Joyce Point oysters ($18) served on ice in the half shell with mignonette and lemon slices. Freshly delivered every couple of days from both coasts! 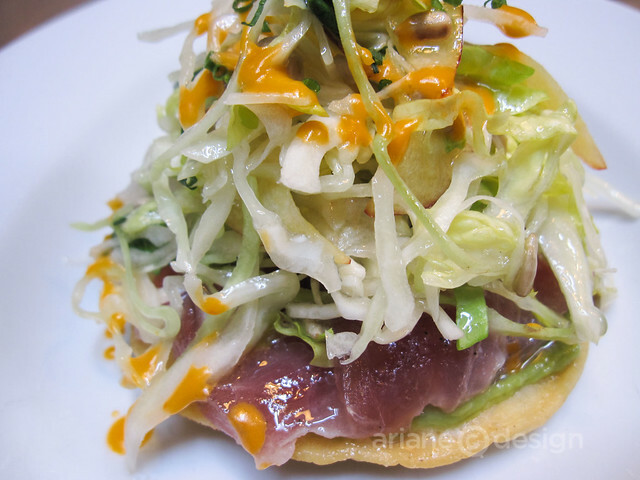 My main course was an Ahi tuna tostada ($16) with avocado spread on the tostada shell and piled high with slaw, tuna, and paper-thin nectarine slices. The lime-chili vinaigrette was a lovely flavour accent for all ingredients while the avocado’s smooth texture complimented the crispy tostada shell. 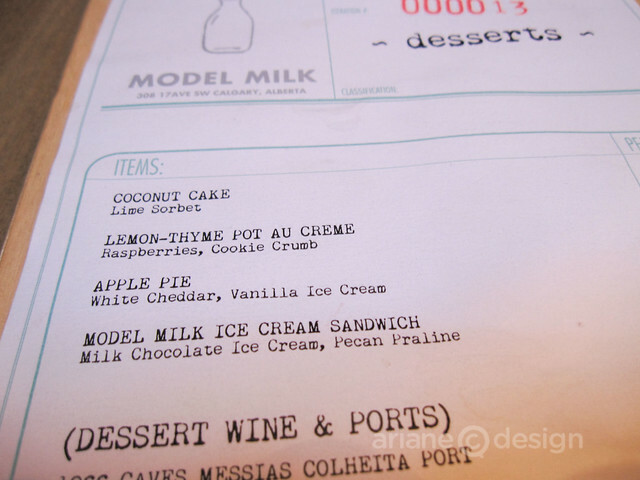 I saved some room for Model Milk’s ice cream sandwich for dessert ($9). 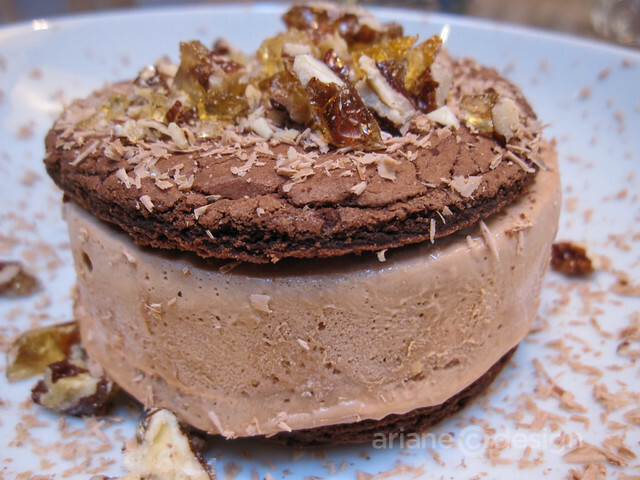 This gorgeous array of sandwiched milk chocolate ice cream is topped with crumbled bits of pecan praline chunks, shavings of chocolate, and chopped pecans. It’s a delightful way to end a meal; I can only reminisce about what an original Model Milk ice cream sandwich might have looked like served at the original ice cream bar. 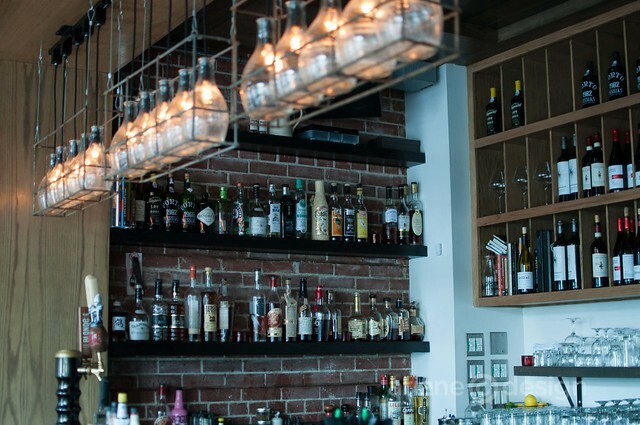 An assortment of craft beer and Canadian and international wines complete the menu. A three course Sunday supper menu for $35 is served from 5 to 10 pm. 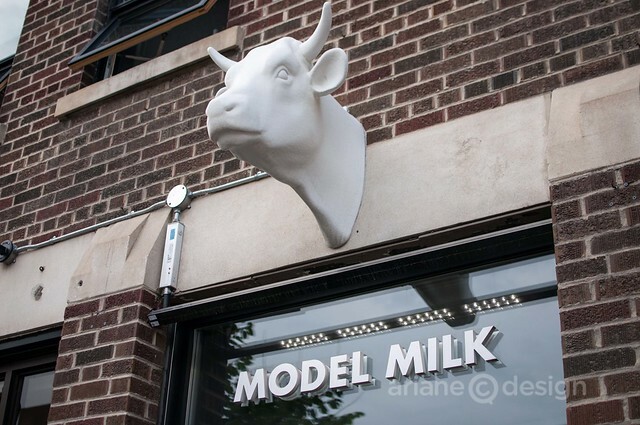 Model Milk is located at 308 17 Avenue SW in Calgary. It’s open for dinner Monday through Saturday from 5 pm to 1 am and on Sunday from 5 pm to 10 pm. Visit the website for more information and reservations. My dinner at Model Milk was compliments of both Travel Alberta and Tourism Calgary.